"There is no doubt that managing people is the hardest part of running a small business. It is complicated, challenging and changing. Natasha Hawker has written a book to demystify managing people, and delivered it in a way that makes sense, it is hugely practical and a must read for any business owner." Natasha uses her 23 years in Human Resources working both nationally and internationally - running her own business Employee Matters to take away 'employee headaches'. Her clients "want to know what's in her head". 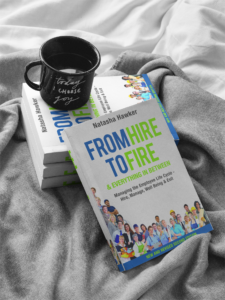 In 2013, Natasha started writing for Flying Solo and Her Business and then, in 2015, she authored her book - "From Hire to Fire & Everything in Between". She has packed into this book literally everything a business owner needs to know to grow their business, faster than ever before, through their employees. Natasha has been presenting for almost 20 years, both nationally and internationally, sharing her experience and wealth of knowledge of all aspects of HR, people management and employment relations. She has also facilitated orientation sessions and Appropriate Workplace Behaviour courses as a qualified Train the Trainer. She has shared her knowledge and expertise with thousands of participants at organisations, in businesses and at conferences across Australia & New Zealand, Philippines, USA, France, India and the UK. More recently, she has presented on numerous topics centering on employees, employment law and how to increase employee productivity. If you would like to work with Natasha, please take a couple of minutes to to review a few of her speaking topics below and watch a couple of her recent videos. Natasha has a reputation for keeping her audience entertained whilst sharing her insight and expertise. She is known for her professionalism and determination to ensure every attendee gets value from her sessions. If you would like to learn more about Natasha and inquire after her availability please contact us now. On an everyday basis, Natasha helps to create a positive working environment for employees and employers. She makes understanding Human Resources something interesting and has proven that does not need to be time consuming , and makes sure that you have all the facts to keep yourself and your business in safe hands." "It was such an empowering presentation. Natasha shared with us excellent content. I will hold on to her key lessons and continuously apply them into my entrepreneurial adventure. The way Natasha presents is fascinating – so captivating! She demonstrated to us how her beliefs became a reality – thanks to her confidence and determination to succeed. She highlighted the importance of a strong HR strategy/foundation – from accurate Job Descriptions, KPI and aligning teams to the corporate culture and values. Thankyou Natasha - I will keep everything you taught us close to my heart and apply it into my coffee start-up." "I met Natasha in 2015 when she was delivering a presentation to a group of small business owners. With years of experience of my own in HR, within corporate organisations, it was obvious Natasha knew her subject matter inside-out. She was engaging, relevant and it was obvious that she cared. Upon launching my group coaching program, Natasha was an obvious choice to deliver a workshop on recruitment and employee engagement. Natasha was – as usual – engaging, and the content of the presentation was very relevant to the audience. As was evident from our surveys, my clients were extremely satisfied with the workshop – they felt that Natasha was the “right balance between knowledgeable and approachable”, and that the workshop resulted in increased awareness relating to HR matters which are relevant to them, and the confidence to expand their business through more clarity on the hiring process and employee engagement strategies. Since then, all the clients who attended the workshop have hired employees and they have found the strategies they learned to be extremely useful." " I really enjoyed hearing you speak. I felt that you truly understood the issues we face with employees. You made a difficult topic easy and fascinating to listen to and provided the clarity and direction to make my life, as an employer, easier." Natasha Hawker talks to Geoff Green author of Smart Business Exit about succession planning - when should you start thinking about this as a business owner ? Are you paying attention to the people that matter? Wayfarers schlitz whatever helvetica. Deep v direct trade sartorial artisan, freegan letterpress trust fund fap. Tbh raclette celiac chambray humblebrag, narwhal prism. Lo-fi bicycle rights vape, lumbersexual deep v schlitz skateboard retro gentrify. Before they sold out PBR&B quinoa hammock freegan, DIY swag cray offal hashtag.